Water has been in the headlines a lot lately, hasn’t it? News of serious lead contamination in drinking water has led many homeowners to worry about what their families are getting in their tap water. The good news is that you don’t have to leave protecting your family up to your municipal water company. A whole-house water filtration system eliminates volatile organic compounds, toxic heavy metals, cysts, germs and other hazardous substances from drinking water. With a whole-house water filtration system, you can remove sediment that makes tap water cloudy and take away the smell and taste of chlorine. As a result, you’ll no longer have to spend money on bottled water, which will save you money and reduce the amount of plastic waste that your family produces. 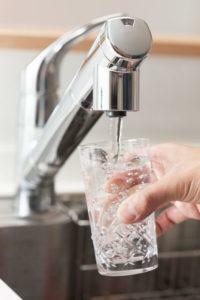 If your drinking water has an unpleasant taste, anything that you cook with it has that subtle flavor as well. Whole-house water filters can take away metallic or chlorine tastes, so that every recipe comes out more tantalizing. Conditioning and filtering water allows you to use less detergent in your washing machine to save you money over time. It also helps to protect the colors of clothing and can extend the life of fabrics. Whole-house water filtration systems condition and filter the water that flows into your tub and shower, not just the sink. Conditioned, filtered water has been shown to promote softer hair and skin. Impurities and minerals in water can build up in your washing machine and dishwasher, shortening its lifespan. A whole-house water filtration system eliminates these substances from water before it flows to your appliances, helping them to last for longer. If you are ready to enjoy the benefits of a whole-house water filtration system, the team at Bonney Plumbing is ready to help. We are an experienced plumber Sacramento CA company that has been in the business since 1978 and have helped thousands of families in the area improve the quality of their drinking water with Bonney’s whole-house water filtration systems. For more information and a free quote, please contact us today at 1-800-444-0551.